Here is a procedure all paramedics can follow at the scene of an accident when they come across your cell phone. If we were to be involved in an accident or were taken ill, the people attending us would have our mobile phone but wouldn’t' know who to call. Yes, there are hundreds of numbers stored but which one is the contact person in case of an emergency? Hence this 'ICE' (In Case of Emergency) Campaign. The concept of 'ICE' is catching on quickly. It is a method of contact during emergency situations. 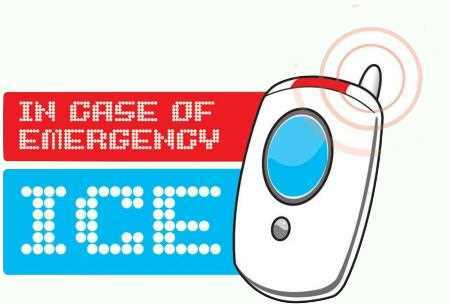 As cell (mobile) phones are carried by the majority of the population, all you need to do is store the number of a contact person or persons who should be contacted during emergency under the name 'ICE' ( In Case Of Emergency). The idea was thought up by a paramedic who found that when he went to the scenes of accidents, there were always mobile phones with patients, but they didn't know which number to call. He therefore thought that it would be a good idea if there was a nationally recognized name for this purpose. In an emergency situation, Emergency Service personnel and hospital Staff would be able to quickly contact the right person by simply dialing the number you have stored as 'ICE'. Please forward this. It won't take too many 'forwards' before everybody will know about this. It really could save your life, or put a loved one's mind at rest. ICE will reach the people important to you when you are not able to speak.